Last night Pete treated Wendy and I to a loop around the race track at Mount Panorama. This is the view from the top of the hill. It was amazing to be able to drive all around a race track. 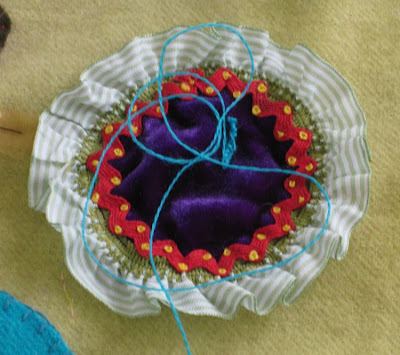 Anni, Wendy, Kaylie, Sam and I also made pincushions from alpaca roving that Linda from Melbourne had given us. 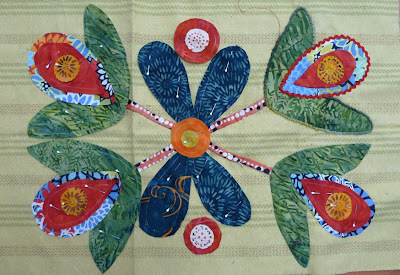 It was fun to sit on the floor, chat and create together. 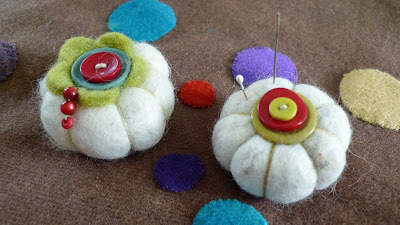 The next day we embellished them with buttons and felted shapes. It will be nice to have a little Australian alpaca to take home. Today I finished up the last class here in Australia. I was delighted with the results from the 24 students in the Magnolia class here in Bathurst. Each block was unique. 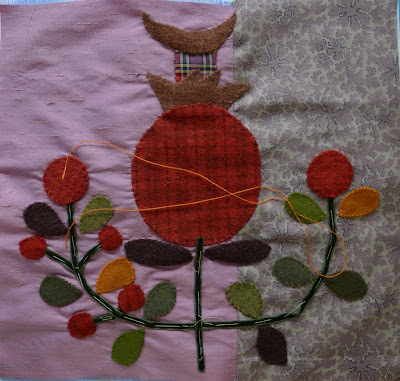 Many worked on the thistle block all with different results. 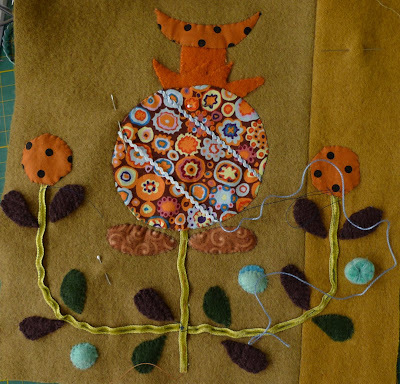 Others worked on the four flower block and bird block. 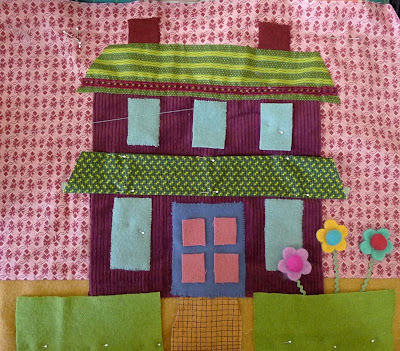 Cathy was the only one who worked on the house block. 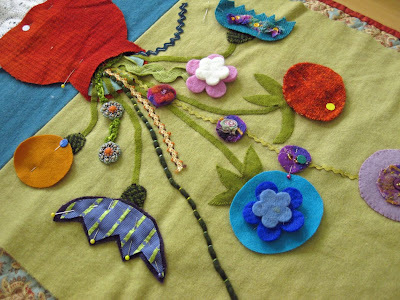 It looks like she has a great start to the quilt in her own color palette. 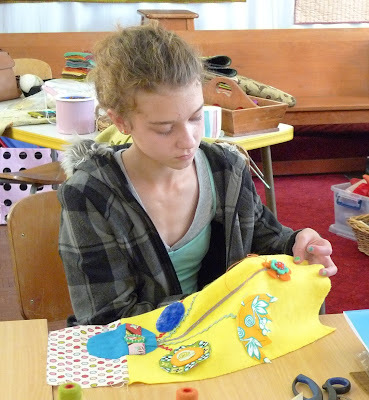 Sammy, Anni and Peter’s daughter spent the two days stitching with us. 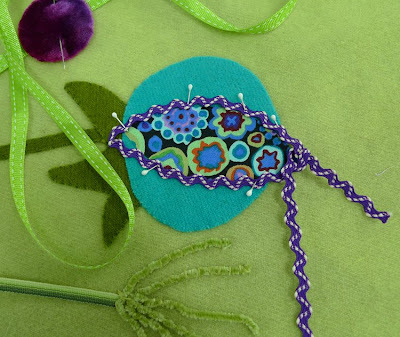 I was amazed at the wonderful piece she was creating. It is always so wonderful to see young girls so engaged. This has been a wonderful experience. Thanks so much to Anni and Peter for making us feel so welcome and letting us be part of their family. I will always have such fond memories of our visit to Australia. 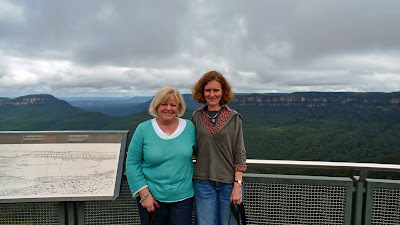 Wendy and I are heading back to Sydney tomorrow for two days and then will be returning home on Wednesday. Thanks to everyone who has been apart of this experience! On Thursday we flew to Sydney and were picked up by Anni and her husband Pete. 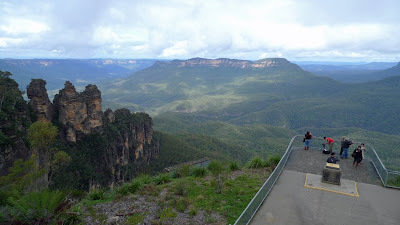 They drove us up and over the Blue Mountains where we stopped for a lovely lunch at a cafe overlooking the mountains. The views are stunning and the area definitely needs a much longer visit. 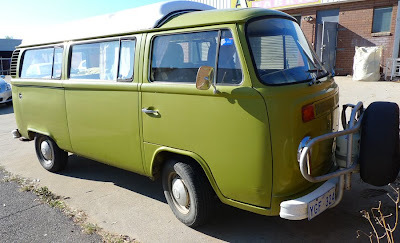 We arrived in Bathurst in time to stop at their store The Home Patch and have a look around. The temperature here is much cooler than Brisbane and feels more like an American Fall with the leaves turning color and a definite chill in the air. Standing outside the store I felt as though I had been transported to a small village in England. 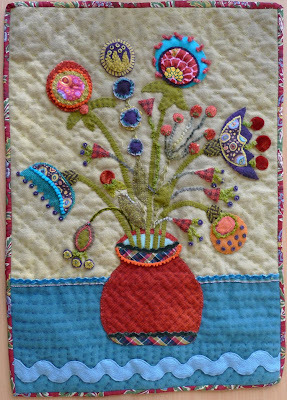 The store is absolutely charming and cozy and I can see why it is a popular destination for quilters. It is that kind of place you feel instantly at home in. We then settled into our bed and breakfast and later were treated to a Thai dinner cooked by Pete. Anni and Pete have really gone out of their way to accommodate us and Pete has been cooking the most wondrous meals. Last night we had a wonderful Moroccan feast shared with friends and family and tonight is barbecue night, our first since we have been here. 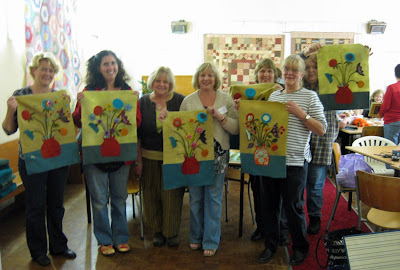 The first day’s class had 21 students and the 2 day Magnolia workshop has 24 so the classes are being held in a small church two doors up from the store. Annie and Pete rearranged all the furniture and set up a great classroom with a small store setup in the back for all the necessities. 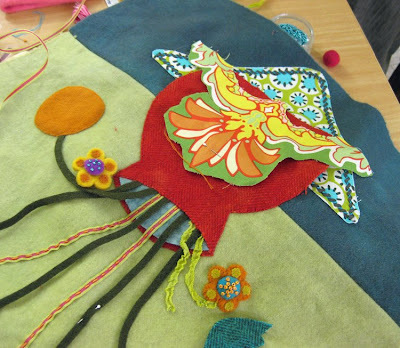 The first day of classes was the embellishment workshop where everyone got off to a good start. 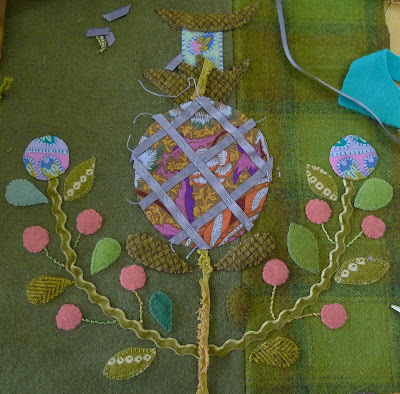 Here are some details of the pieces that were started. 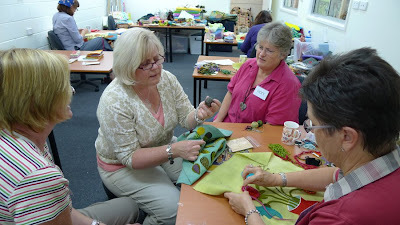 Erin who took the first workshop Sue did in Sydney sent along her finished piece with a friend to share with everyone. Here it is. 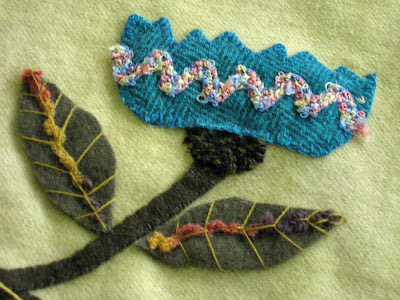 Jenny who also took the one day workshop in Sydney decided to come to Bathurst for the Magnolia workshop and this is her piece. Both look fantastic. 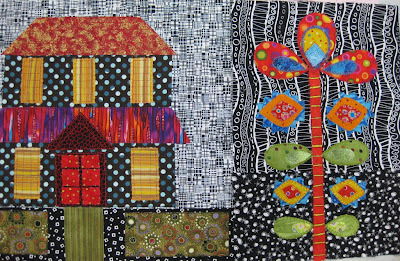 Sue, Anni and I were able to see an exhibition by a woman called Liz Williamson at the Bathurst Regional Art Gallery. 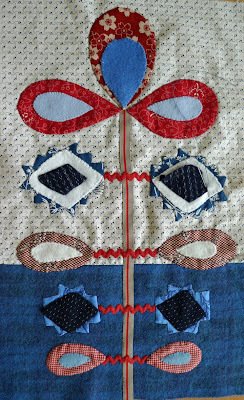 She is one of Australia’s most respected textile artists and her weavings were beautiful and thought provoking. 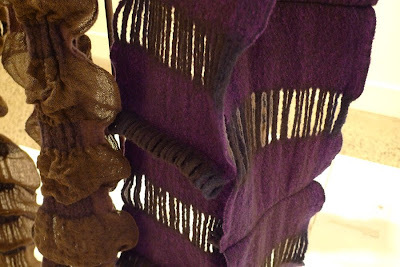 I was especially interested in her hand-woven wraps and scarves that combine linen and felted wool. 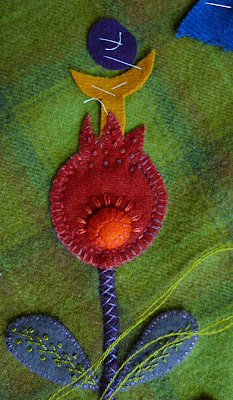 I found the combination of fibers and techniques very interesting. Our dear friend Melissa was very much in my thoughts as I wandered around this exhibit. Tomorrow is the last day of teaching while we are here. It is hard to believe that we are coming to the end of our stay. 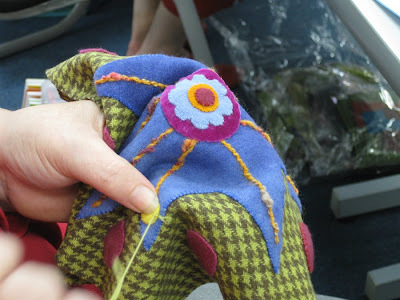 Sue has been teaching Magnolia for the last two days to an enthusiastic group of stitchers who are loving the handwork. They have all made great strides and the blocks they have chosen to do are coming together. 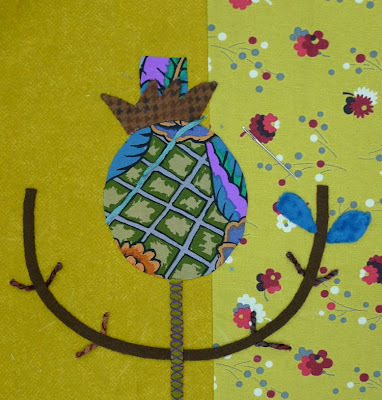 The vase with two birds is a popular block as well as some of the flower blocks. These photos were taken part way through day 2 and all the blocks have had a lot more work done on them since. 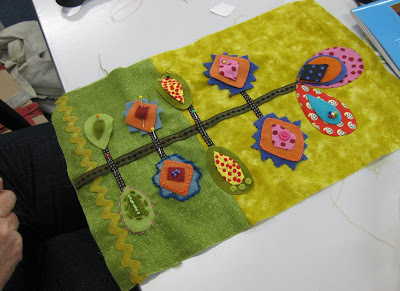 I thought it was interesting to see a group of the same blocks together since it shows how everyone chooses different colors and embellishments as well as embroidery stitches. They are all unique and individual creativity shines through. 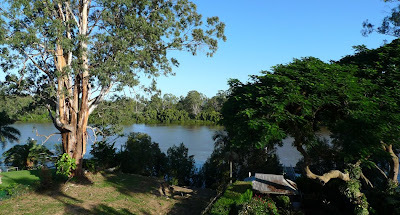 Whilst in Brisbane we have been kindly hosted by Karen and her husband Andrew who have a lovely home down on the river. We have spent our evenings and mornings sitting on the deck enjoying the surroundings and watching all the beautiful Australian birds as well as a possum or two. 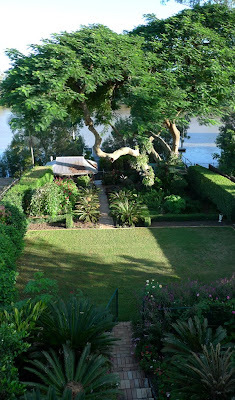 They have a wonderful garden and the river looks very inviting. It would be a wonderful spot to kayak and enjoy some quiet time. Karen kindly dropped me off at the Gallery of Modern Art where I spent a few hours. I saw the exhibits Cultural Warriors and Breaking Boundaries. Both exhibits were about contemporary Aboriginal art and were very inspiring and thought provoking. 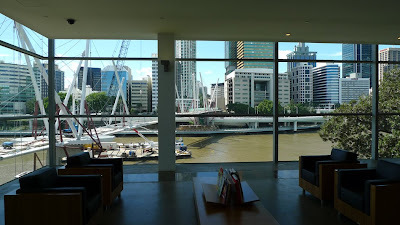 The museum is situated on the south bank of the city and this is the view from one of the galleries. A highly recommended museum to go to if you are ever headed this way. 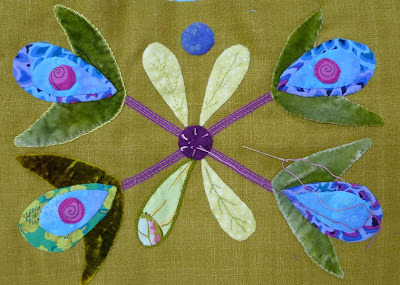 Now back to stitching! Wendy and I arrived on Sunday afternoon in Brisbane. 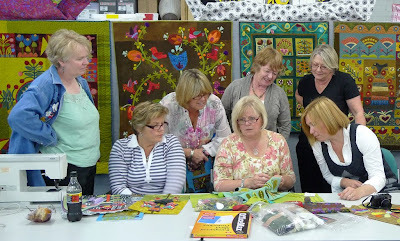 We had an introduction to the Quilters and Embroiders store which is filled with fabrics and embellishments. Karen the owner then took us for a drive around the city and up to this wonderful view point over looking the city. 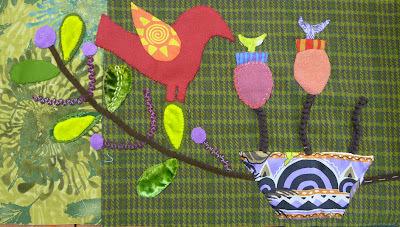 The first day of class I taught the Altered Texture class. I am always amazed at the results. 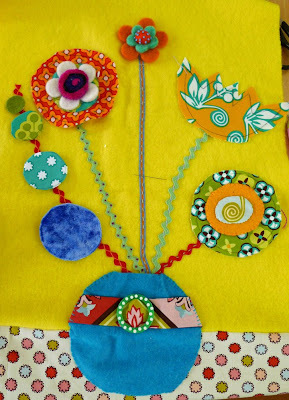 Each student starts with a kit which is stitched ahead of time then we spend the whole day drawing in our journals and embellishing the block. 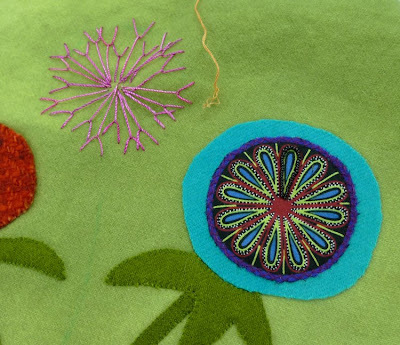 They experimented with couching, beading and embroidery stitches. 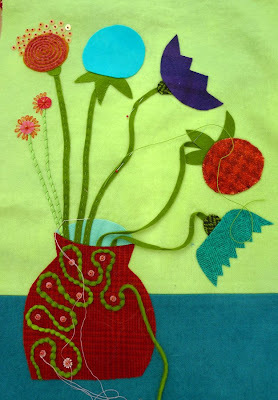 Some used rickracks and chenille yarns for stems as well as stitches to form flowers. 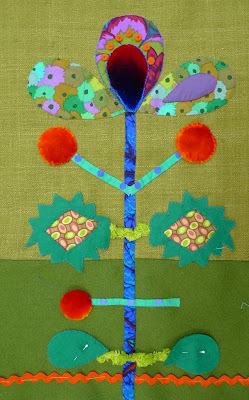 It was fun seeing what we could do by fussy cutting fabrics to form flowers. 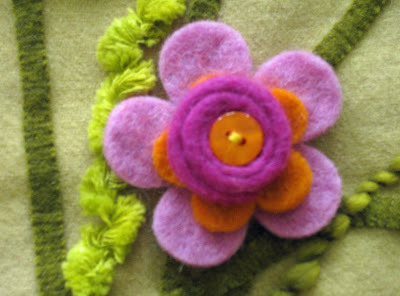 We also used wonderful hand dyed velvets, sequins and beads. As you can see each piece was a little unique. 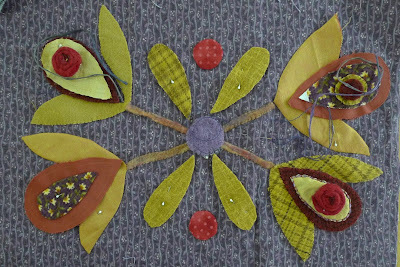 They all seemed to get a good start to an embellishment piece, I hope they will continue to stitch on. The variations are endless and I always come away inspired and ready to experiment with more techniques myself. 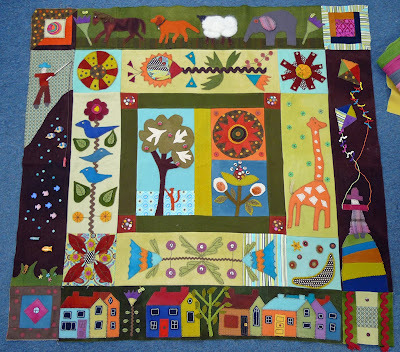 Addicted to Fabric is a wonderful store owned by Jenny and Noel in Canberra. 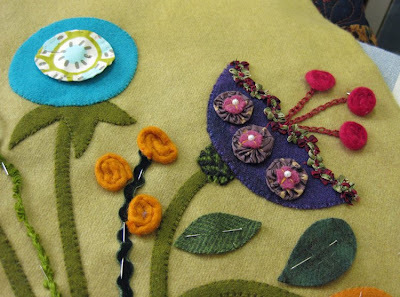 It is filled with the most beautiful range of fabrics for both quilting and dressmaking and is managed by Kerry and Samantha. The class was filled with very enthusiastic students. 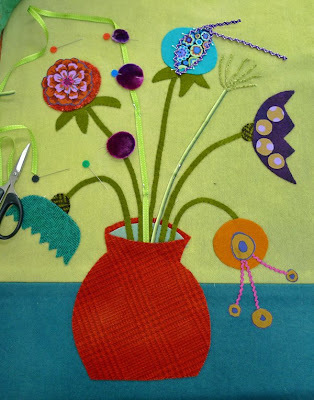 I was amazed at how much they accomplished and how different all their work was. 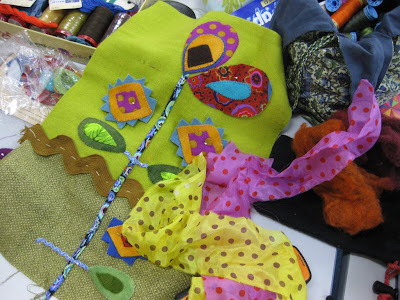 Jenny had an amazing assortment of ribbons and buttons which many of the students used in their blocks. 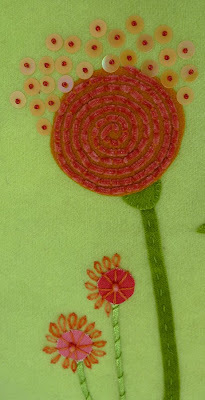 Some worked in cottons as well as stitched them creatively on the machine. I loved that each student started with a different block. It was very inspirational and many ideas were collected throughout the two days. 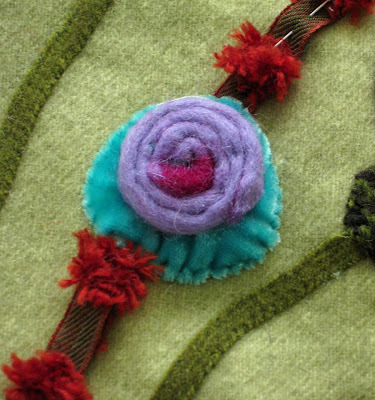 Some worked with hand dyed velvet and silks as well as embellishment yarns. 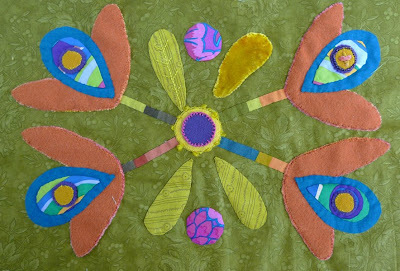 Judy has worked up many of my patterns over the years and also teaches some of my quilts. 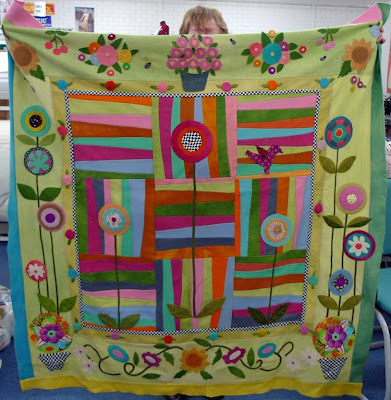 I was delighted that she brought this great quilt of hers to share. 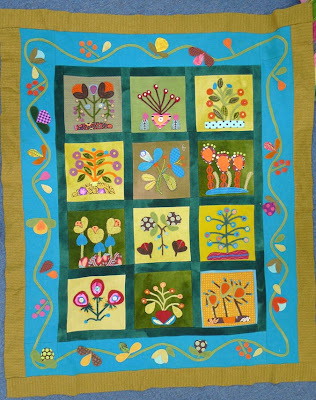 She made her quilt out of her own hand dyed wools. 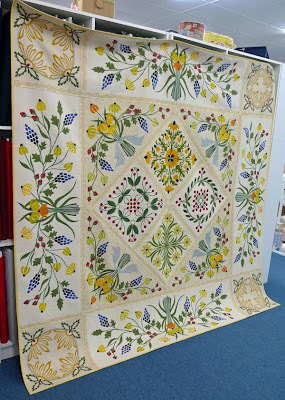 And this Folklore quilt was made by Annette from Sydney. She took the main theme and gave it her own personnel twist. 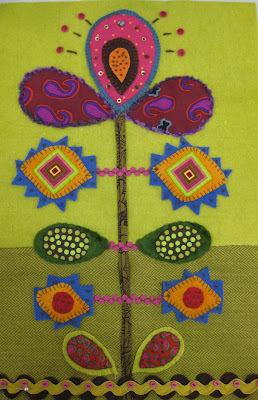 I just love what she is came up with. 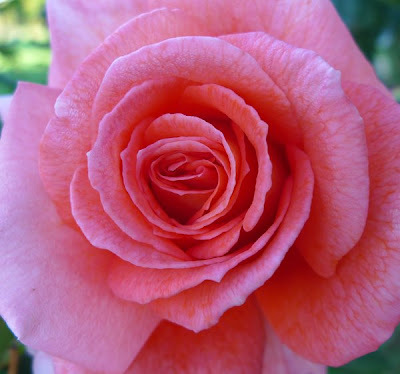 It was a pleasure to meet many people I have communicated with via email and now can put faces with names. 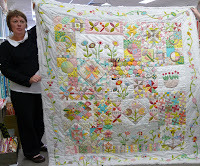 I was very fortunate to see Kerry’s wonderful quilt all done on the machine. I thought Jason would be very envious to see what we got to ride in each morning. Many thanks Jenny, Noel, Kerry and Samantha for making both Wendy and I feel so welcome. Our visit was short but we will have fond memories. We have spent a couple of lovely days with Jenny. 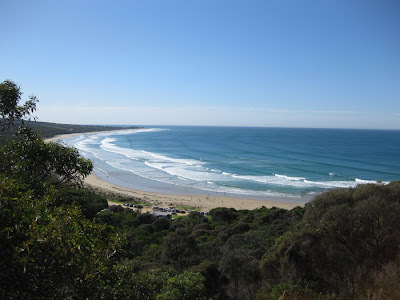 Yesterday she kindly took us on a day trip down the great ocean road. 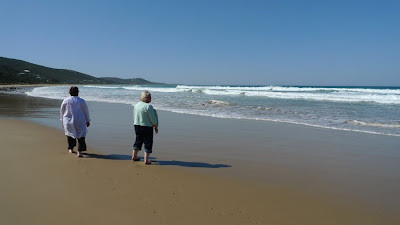 We loved the views of the pristine beaches and did have a little walk along the beach. The sand was so soft and the weather could not have been better. 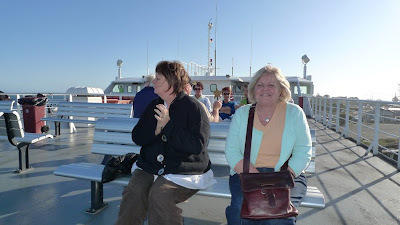 We stopped for a fish and chip lunch and then headed down to the ferry which carried us across the bay. The woolies had to come out for the ride across but the views were great. The fur seals made a brief appearance alongside the boat. A great day of sunshine and fresh air. The day before Jenny and her husband took us to the Healesville Animal Sanctuary where we enjoyed the local and very sleepy wildlife. 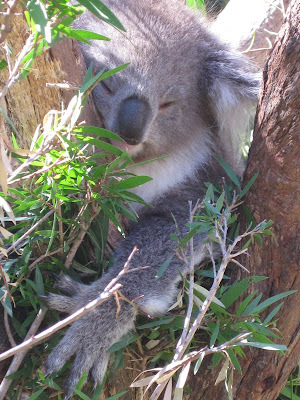 The koala was cooperative but the kangaroos refused to stand upright. I think it was way too hot to expend any energy. We enjoyed looking at all the mammals and marveled at how different they were from the African animals we know so well. When we were driving along the great ocean road we were rewarded with a lovely site of a family group of kangaroos. This time we saw them just in time before they settled for a snooze under the trees. 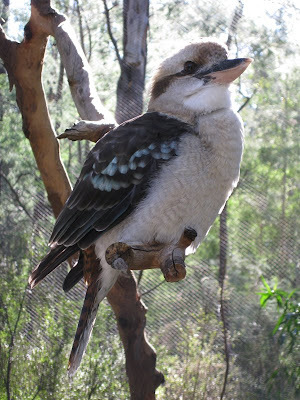 Of course you cant forget the birds and we loved this guy, the Kookaburra. We finished the day off with wine and fine dining. The vineyards of the Yarra Valley were beautiful, lush and green. A reminder of the recent bush fires scar the hills in the distance. It was a very humbling experience. 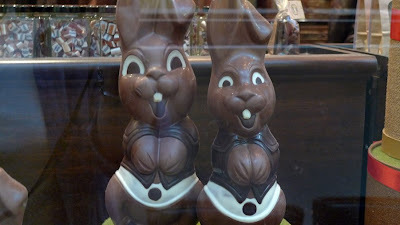 Happy Easter from Down Under. It is a beautiful morning here in Melbourne. We are having a wonderful few days off taking in this beautiful city. Yesterday we spent the day walking around town. Even though it is fall here there is still wonderful color everywhere you look, a little contrast from winter in Ohio. It reminds me so much of South Africa. There is a large French influence here. 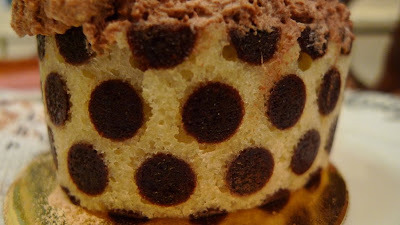 Wendy and I stopped at a French Bakery for a latte and could not resisted this small chocolate mouse cake. 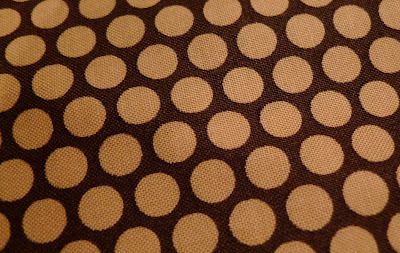 As you know I love polka dot fabric and had to have this cake which reminded me of the Japanese honeycomb dot fabric I just bought at Amitie the day before. 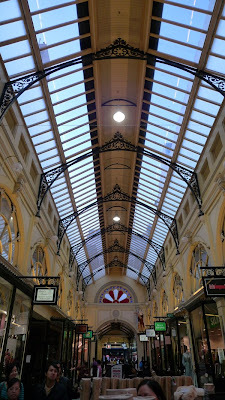 Here is another glimpse at the wonderful architecture in Melbourne. There are many arcades and ally ways that have many cafes and stores. Each one has great character. 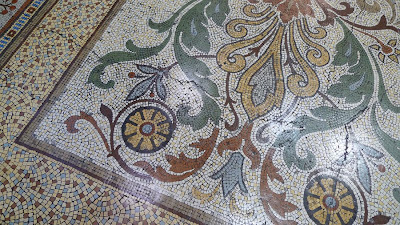 Here we found a great glass roof and mosaic floor in the same arcade. 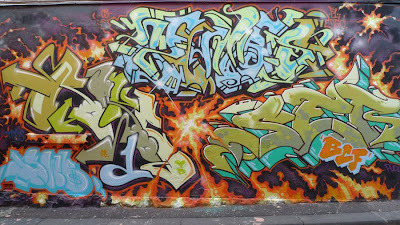 Around the corner was another ally way full of graffiti. Today we are off to the museums and an outdoor market. Wendy has been educating me about Australian jewellers so as you can imagine I am in big trouble as many pieces I have seen have needed to return home with me. 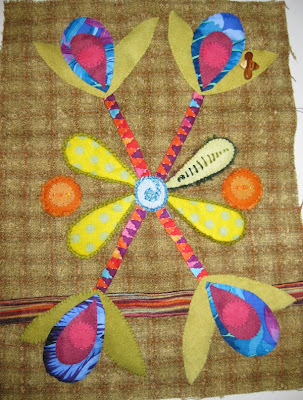 The style is earthy and organic and very appealing. We moved into a self catering apartment in the city center of Melbourne today where we get to stay till Thursday. 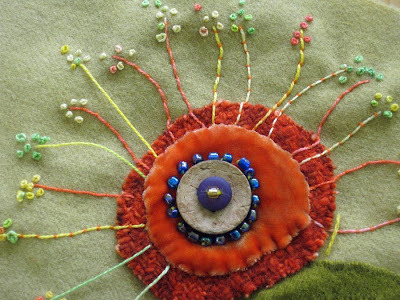 It looks like we will be enjoying the many art and craft venues that this city has to offer. Today we had a nice walk around town and stopped in to see the beautiful tile floor of St Paul’s Cathedral. 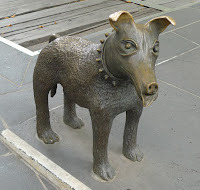 This sculpture caught our fancy and reminded us of the critters we left at home. 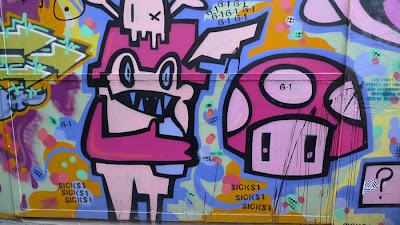 A few people had told us that this city is known for its streetart and when we came across this area we could see why. We enjoyed the scale of it and loved the mass of color. Of course we thought of Jason and how much he would have loved all this as we meandered through the streets. I loved that even the trash bins were covered. 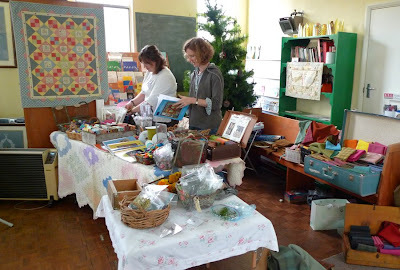 Tomorrow we are off to a craft market and I am sure we will be inspired. 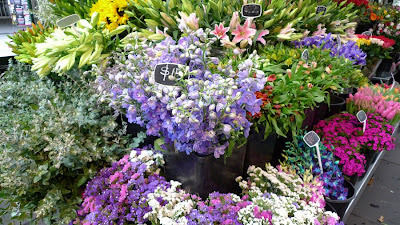 We were met at the airport by Jenny Kingwell, director of Amitie in Melbourne. We arrived just in time for lunch and a quick visit to the store which is lovely. 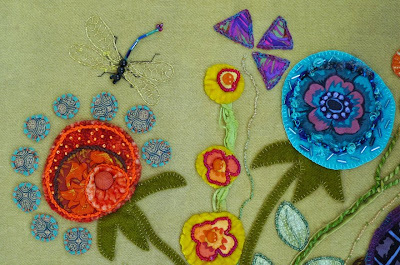 It was not long before Sue had acquired a new little stash of fabrics to take home with her. Jenny has a beautiful selection from which to choose. After settling into our B&B we had a nice Vietnamese dinner and got ready for Day 1 . 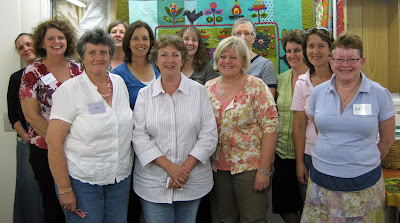 On the first morning we were welcomed by 18 enthusiastic quilters. 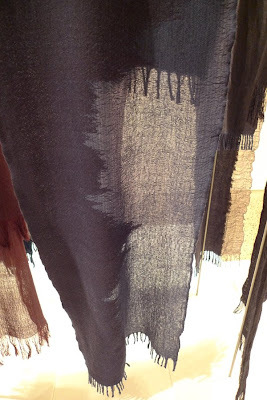 All were ready with their large stashes of wools, cottons and linens to begin cutting and reassembling a block into their own color palette. 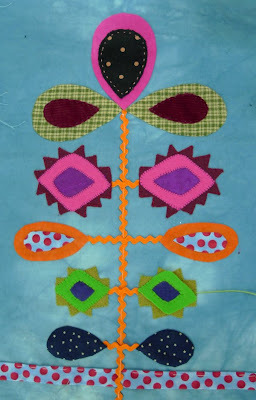 They all concentrated on appliqueing their block so we could have a foundation to embellishment the following day. 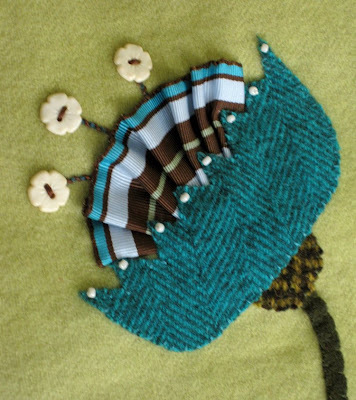 Here is a fabulous color selection from Gina and Amanda. 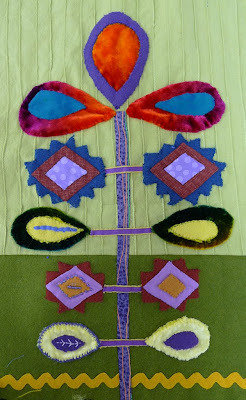 Carol worked on doing bullion’s and Lynn work with velvet and mastering applique. Kelly added her own elements to her block. As you can see the blocks were stunning. All very individual and quiet unique. Wendy caught me here trying on my new cardigan I purchased from one of the girls in the class. 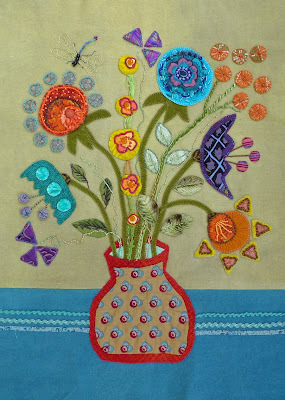 I just adore her work and also love the fact that it is all wool!